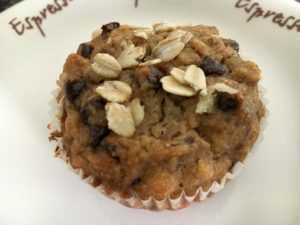 These muffins used to be a staple in our house. The kids loved them. Usually made the mini versions. The original recipe called for quite a bit of sugar. I have removed the sugar and replaced it with some maple syrup. I think it works. It is the latest treat recipe to be ‘shifted’. I hope that your family enjoys them as much as ours. Preheat oven to 325. Grease muffin tins with olive oil or line with paper cups. Mix the coconut oil and maple syrup in a large bowl until well blended. Add the eggs, and whisk it all together. Mix in the banana and the milk or water. Add baking soda, vanilla, salt and cinnamon. Add the flour and oats and mix until blended. Add chocolate chips. Spoon the batter into the muffin cups, until each cup is approx. 2/3 full. 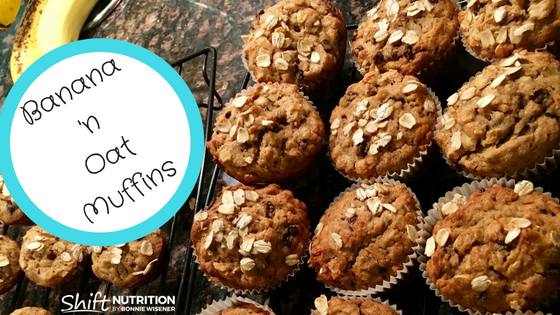 Top each muffin with a sprinkle of oats and a tiny bit of sugar.